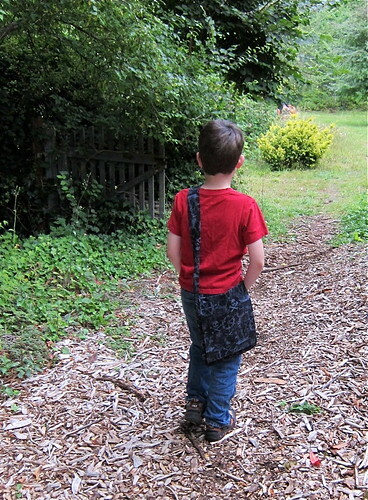 Welcome to Week 39 of the One Yard Wonders Sew Along! Alicia selected Robert Kaufman’s A Pirate’s Life For Me Jolly Roger Black and A Pirate’s Life For Me Treasure Map Sand. The pattern was fun and well-written. Alicia would definitely make this bag again. Alicia used quilting cotton rather than home dec fabric. 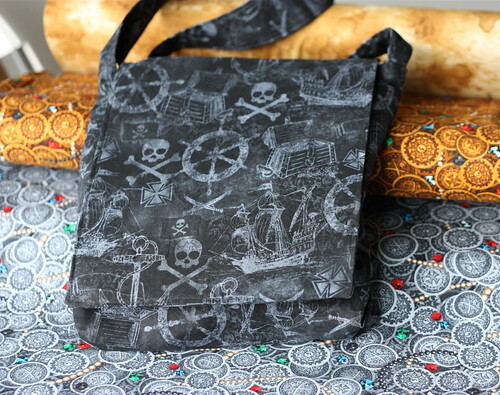 She added some fusible interfacing to make the bag more sturdy. Light weight interfacing on the exterior piece and strap. 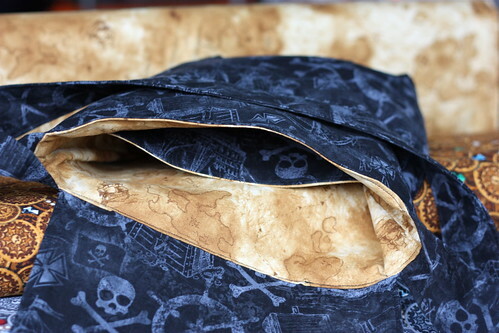 Medium weight interfacing on both pieces of the bag flap. She did not interface the pocket or lining fabric. Alicia lengthened the strap a couple inches, but otherwise didn’t alter the size. It’s the perfect size for an 8-year-old. 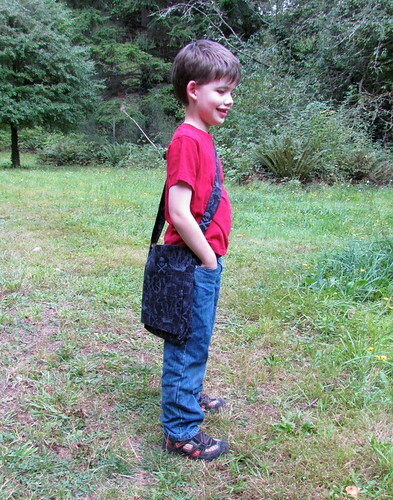 Oliver loves his messenger bag! 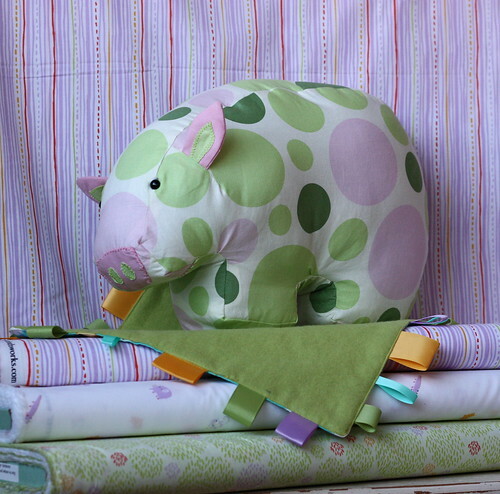 Melissa chose 3 fabrics from Heather Bailey’s Nicey Jane collection: Dream Dot Celery, Hop Dot Cherry, and Lindy Leaf Tangerine. Melissa’s Tips and Thoughts ~ In her own words. 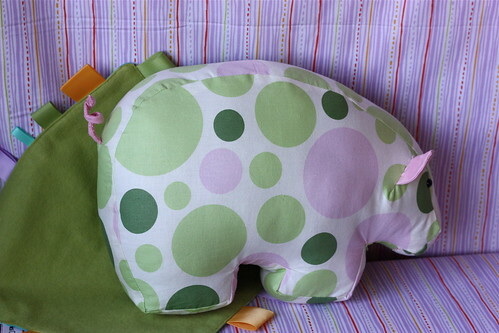 Melissa, “I decided to make a Cuddly Pig/Bear Cushion and name it Dot…I am not sure why I decided to make a pig instead of a bear, but I just thought it would be cute. AND it is cute, but I should have changed the shape to make it a little bit rounder (aka, not so bear like). It kind of looks like a bear and a pig had a baby. Hee hee. I loved this patten. Super cute and not too difficult. The only issue I had was the markings on my gussets didn’t line up with my pattern marks. I continued anyway and it worked out just fine. Next time I make this I will mark my sew lines from the pattern. I think it will make it a little bit easier when sewing. Sewing the gussets on the main fabric was a little bit time consuming, but not hard if you take it slow. I used doll eyes instead of buttons for eyes because I didn’t have two matching buttons in a color that would go well with Dot’s outfit. Note to self: Time to start collecting buttons! Ears: I cut 4 pieces of contrasting fabric instead of two from main and two from contrasting. I didn’t use the ear pattern piece, instead just free hand cut what I thought to be pig ear shapes. I added green inside ear by cutting two pieces a little bit smaller and then appliqueing them on to two pieces. I then followed the directions from there. Tail: I used a piece of picture hanging wire cut to about 4 inches. I cut a strip of fabric 5 inches by 2 inches in contrasting fabric. I folded it like bias tape and then folded it again. I wanted it to be pretty thick so the wire wouldn’t poke through. I fashioned a point on the end of the tail and inserted the wire. 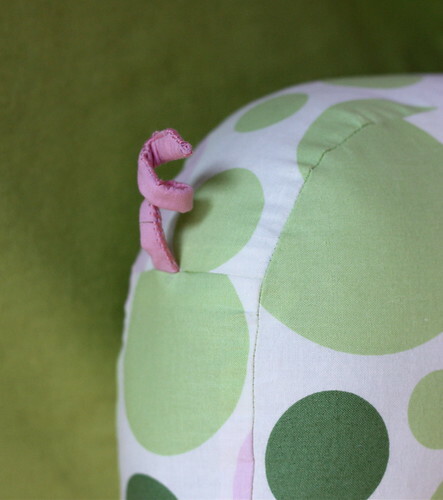 I then slip stitched the edge (you could do this part by machine). I followed the directions to insert the tail. After the pig was all sewn up, I curled up her little tail. 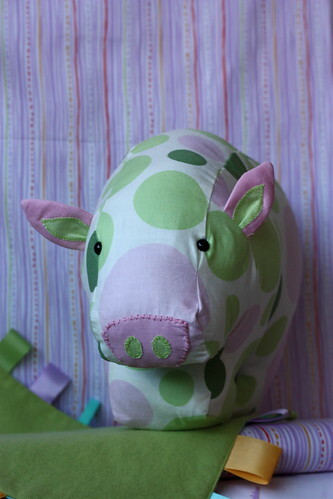 Nose: I followed the directions except before applying the fabric to the felt, I appliqued two little ovals on the nose.